Galactic Strike Force is a cooperative, deck-building game in which two to six players each take control of a ship and a crew in defense of the galaxy! Dangerous opposition forces threaten to overrun the entire galaxy, and the players must not only build up their ships, but also work together tactically to stop them! However, this Strike Force is not made up of stalwart defenders, space cops or Volnethian Guardians. In Galactic Strike Force, you play as scoundrels — members of the galactic underworld! Smugglers, space pirates, gun runners, bounty hunters, and information brokers make up the ranks of the Strike Force which has come together to defend the galaxy! 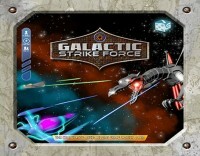 Galactic Strike Force takes about an hour to play and all of the players are engaged throughout the entire game. Rather than having individual turns, each player is constantly acting through the phases of the game, and each ship is in constant peril! As the game progresses, players travel from sector to sector, purchasing powerful tech upgrades for their ships and boosts to help them in battle. Then, after installing the techs, the Strike Force ships engage the opposition ships in battle throughout the galaxy! I played this game at a Demo during PAX East 2014. It was a great co-op game! It seems very tough & I cannot wait to try it again. The base game components are good. Very standard tokens & what not for tracking where you ship is & everything. They do have upgrade packs you can buy to get minis for your ships and a nice playmat. The game seemed to be pretty tough, even with the enemies dumbed down for the demo (each enemy ship had 2 shield damage done to it out of the gate. This game has a ton! There are a bunch of different locations to randomly select coupled with a couple of different Big Baddies in the base set. It did seem a little difficult to learn & I was glad we have the demo-giver there to help us though it. Add a Review for "Galactic Strike Force"